I don’t know about you, but when I think of Ibiza weddings, I think of cool blue seas, stunning beaches and a fun-loving Spanish vibe, which weaves its magic across the whole island. And if you did not know, Ibiza is not just in a league of its own when it comes to beauty, but also when it comes to weddings too. And this is why I am so excited to introduce you to Wedding Celebrant Danielle Alex, who if you are thinking about getting married in Ibiza, already have your eye on a venue, or are just about to start Googling Ibiza weddings right about now, then Danielle is one awesome lady that you ought to check out. So what are we waiting for? Let’s dive right on in and find out more about the woman who describes herself as “happy, romantic and down-to-earth,” and about the awesome wedding ceremonies that she leads in Ibiza and Formentera. Oh, and also what happened when the wind blew her couples’ wedding vows away! What do you love about being a Wedding Celebrant in Ibiza? I love getting to know each couple and writing something that describes them and their relationship perfectly, so that on the day people are laughing, crying and talking about it afterwards. Before I became a Celebrant I actually did many things. I had never really known what my calling was, so I tried lots of different jobs, but always came back to customer-centred roles as I love being around people and the pride that goes along with providing excellent service. I’ve worked in clothes shops, restaurants, as a kids’ rep in hotels, in a recruitment agency and a villa rental company. For the last 5 years my dream was to be able to work from home and for myself, but I never knew what that would be doing, then finally life gave me a nudge and I discovered my dream role. Is there anything about your previous jobs that come in useful as a Wedding Celebrant? Definitely. From the outside the roles I’ve had seem completely different, but they have all helped to hone and refine my skills. In one of my first jobs the company slogans were “Go the extra mile” and “Make customers feel special”, and these stayed with me through every role I’ve done since then. I don’t like to do anything by halves or leave a job incomplete, and when it comes to something as important as writing and performing couples’ wedding ceremonies, I would never want to do anything less than my full potential. This combined with the fact that I’m admittedly really good at admin and computer-based work (I’m as cool as it gets) helps a lot! What is your favorite type of wedding venue? Well, on Ibiza there are no bad choices! Each of them has its own beautiful characteristics, but the most important thing is that the couple choose the one that suits them the most. That’s such a tricky question! The first ceremony I ever performed will probably always be one of my favourites, they knew I was new to the role but we clicked when we first met and they had such trust in me. I was so nervous beforehand but when I was standing in front of everyone, with the groom standing nervously next to me, and seeing the bride enter and his eyes fill up with tears (and mine too! ), my nerves melted away as it was so clearly not about me, it was all for them. It was a light, fun, personal ceremony and I joined the wedding party for a glass of champagne afterwards where the family members where telling me how lovely the ceremony was. That was such a wonderful start for me and I will always remember that couple and that day. There have been lots of memorable moments since then, but being asked to travel to Valencia to perform a wedding ceremony was a pretty big deal. Knowing that the couple could have chosen someone recommended by the venue or close by, but wanted to book me specifically, even though I would need to travel and stay overnight to be there, was really lovely. The ceremony was gorgeous and afterwards they told me “it was exactly what we wanted.” It melts my heart to know that I could make this happen for them. That love comes in many different forms, it is unique to every person and every couple. What are your favorite types of wedding ceremonies? My favourite types of ceremonies are when the couple really care about customising it and getting involved in the process. What is your favorite symbolic ritual? I love the ring warming ceremony, where the guests pass around the rings in a small bag, holding on to them and giving their wishes and blessing to the marriage, before passing them forward to the couple for the ring exchange. Tell us about a funny, hair-raising moment during a wedding ceremony. I was performing a ceremony at a beach restaurant where I was stood on a rocky area with the sea just a couple of metres behind me. I had printed off the vows for the bride and groom to read from, and as I took them out of my folder in preparation to pass them over, the wind picked up and they flew off quickly behind me! Luckily, they fell to the ground and I was able to run and pick them up quickly before they took off again. It wouldn’t have been the end of the world as I had them printed in my folder, but still, it would have been a little bit awkward! How would you say the wedding industry has changed in the last 15 years? I remember attending wedding ceremonies when I was younger and being bored or tuning out whilst the officiant was speaking, as it had no relevance to why I was there or anything to do with the couple. They seemed like they were just saying all the words that they have to say – the same ones that are spoken every time they marry someone – so in the end, these words weren’t actually worth anything to anyone. We were all just waiting for the good bit! Now there are so many options, in regards to the ceremony, location, detailing – you name, you can take control and make sure it reflects you and your relationship down to a tee. What kind of couples do you enjoy conducting ceremonies for? Couples who gush about each other and want to tell me their stories! 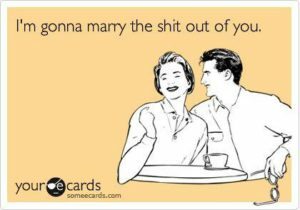 I am such a romantic, I can’t get enough of proposal stories and hearing all the things they love about each other. What advice would you give to couples getting married? Don’t just do things because of a preconception of what you believe a wedding day to look like. At the root of it, it is a day where you get to tell each other that you will always be by their side, why you love them, and what you promise for your future together. Make sure that you keep this at the front of your mind throughout the planning, to keep things in perspective. Research the elements of your ceremony so that you are aware of what each tradition means or symbolises, so that you can decide whether it is something you want to include or not. And when you’re not spreading joy and love at wedding ceremonies, what can you be found doing? Walking my dog, going for nice meals out with my boyfriend, taking coffee breaks with friends, and sitting outside with a glass of wine to people watch in Ibiza town. Isn’t Danielle an utter delight!? 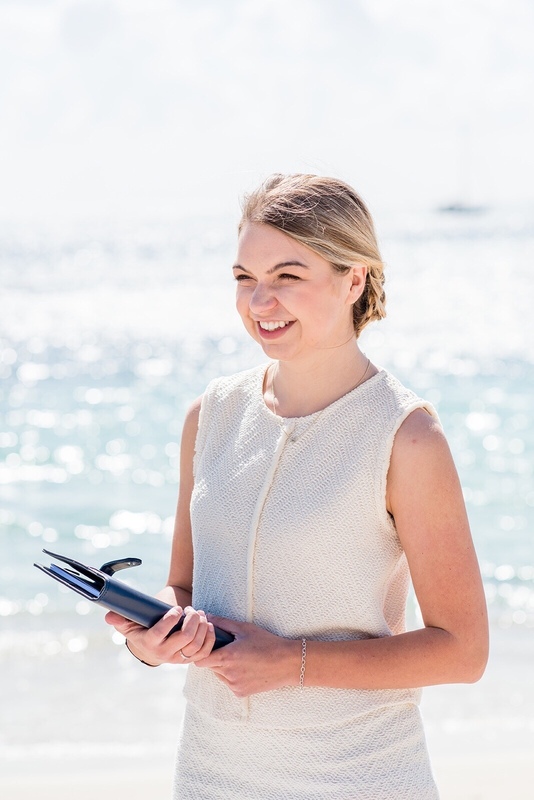 If you’d love to hear more from Danielle about weddings in Ibiza, you can check out her Celebrants Collective profile here or her awesome website here.